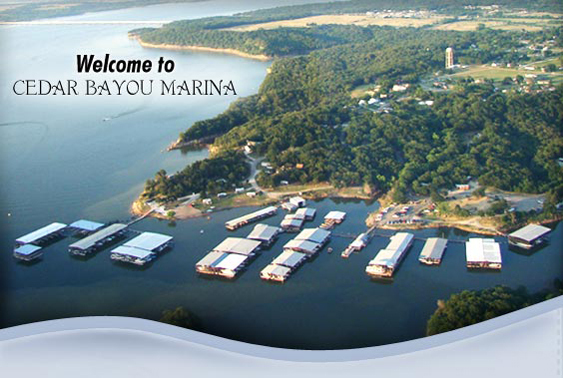 Escape to Cedar Bayou Marina to enjoy the peace and serenity on beautiful Lake Texoma! Our slips offer accommodations from 18 to 60 feet long, affordable boat rentals and sales! Comfortable lodging options including motel and cabins are available for your convenience, perfect for a vacation or a weekend getaway! The motel unit has 4 motel rooms located on a hill over-looking the marina. Complimentary boat slips are provided. Each room has two double beds, full bath, linens and towels, color satellite TV and its own separate heat & window units. A dorm size refrigerator, coffee maker and coffee are included. For large groups the bunkhouse, Charlie’s, and Deer Run cabins are about 25 ft. apart and have a covered fishing dock for cabin guest. Each cabin accommodates 8 people with central heat and air. Other cabins for 4 – 6 people are available with full bathroom, tub and shower, roomy kitchen, microwave, cooktop and oven, dishes, toaster, coffee maker and utensils. Comfortable living/dining areas offer views of the wooded area. A Pavilion and playground are onsite. Cedar Bayou Marina has Pontoon boats, canoes and Kayak rentals available. Pre-owned boat sales and brokerage services are offered. Long-term RV sites have water and electric and select sites have septic (pump out services). Enjoy hiking along the 14 mile historic Cross Timbers Trail! The trail is well marked and mile posts have been erected along the way as reference points. You can expect a moderate to easy degree of difficulty from the trail, as it is ideally suited for weekend adventures into the wilderness and for conditioning in preparation for extended wilderness trips.